For RACE ANALYSIS, including split times, and average speeds for Usain Bolt’s world record, see the related posts at the bottom (or in the sidebar to the right). Usain Bolt delivered. Nobody else stood a chance. It was quite simply the most devastating display of 100m sprinting I have ever seen. The “race” that everyone (including us) had predicted never materialised – Bolt was just too good (and Powell bad, it has to be said). The world record in the 100m is always a special occasion. When it comes on the biggest stage in world sport, the Olympic Games, it’s that much more spectacular. And it does not get much more spectacular than the sight of a man destroying the next seven fastest men in the world, celebrating about 20m from the finish line, pumping his fist against his chest with 10 m still to go, and still breaking the world record by 0.03 seconds. Truly incredible. 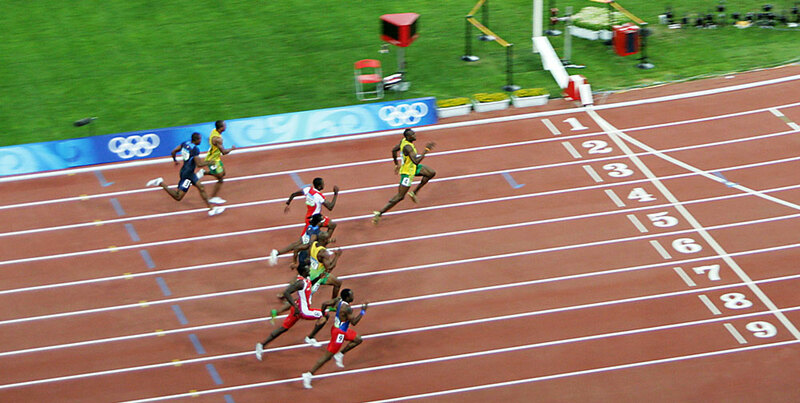 Usain Bolt winning the 100m at the Beijing 2008 Olympics. Photo by Flick user PhotoBobil. In any event, Gay’s presence in the final would hardly have made a difference, so dominant was Bolt. But it is a great shame that he hurt himself in the US trials, because perhaps he might have pushed Bolt a little harder and we’d have seen a 9.65s time, so comfortable was the Jamaican in the absence of any rivals in this race. Thanks to Powell’s disappointing run, the minor medals were won by Richard Thompson of Trinidad and Tobago (silver in 9.89 s) and Walter Dix of the USA (9.91 s for bronze), which was the third big surprise. Both are PB’s, which is as much as one could ask in a big final like this. Fourth went to Churandy Martina of Netherlands Antilles, in a national record, which would have been their first medal – 0.02 seconds denied them that glory. But the star of the show was Bolt. The race was expected to be close, fast and exciting. It was two of the three, but “close” is not a word that fits this final. In fact, the much anticipated “race” never materialised, thanks in part to Gay’s semi-final exit and Powell’s “no-show”. But the main reason was that Bolt was ridiculously fast. His start was, as usual, not particularly spectacular. After about 30 m of running, he was mid-pack, with Thompson in Lane 5 slightly ahead of him. Powell also got off to a good start. But after about 30m, as Bolt’s head came up, he took control of the race and the men who up to that point had looked competitive suddenly looked very ordinary. There cannot be a runner with this kind of acceleration from 30 m in the history of the event. Of course, every generation has runners who are dangerous in the latter half of the race, but Bolt, running 9.69s, moved away from men running 9.89 s and created a 0.2 second lead by the finish line. It was astonishing sprinting. When the cameras showed the race from the front, you could see Bolt actually glancing across to his right, where he knew the big threats would come from. Bolt virtually ran the 100m Olympic Final as a tactical race – he knew where his rivals were, he created a lead between 30m and 80m, and then he celebrated. About 20m from the line, his arms dropped to his side. About 10m from the line, he leaned backwards, and gave himself a chest thump with his right hand. He crossed the line and kept running, bouncing all the way to the back straight as the crowd erupted. That celebration cost Bolt some time – who knows how much? Perhaps he was capable of 9.65 seconds had he continued at the same rhythm. In the end, it didn’t matter. Bolt had the time to celebrate mid race, to look natural and easy running 9.69 seconds. Bolt is a different type of sprinter – previous champions, like Maurice Greene have been muscular, powerful, strong men, who burn up the track with the sheer force of their running. Bolt is different – he bounces, flows like water, and looks incredibly easy running faster than anyone else has ever been able to. I would love to see a biomechanics analysis of the race, but for a basic illustration of the difference, consider that Bolt took 41 steps to run the race; everyone else took 44 steps. What is the physiology that underlies this advantage? Very difficult to say…explosive muscles, certainly. Muscle power, yes. But there’s something there that no scientist can measure. I believe the big difference is neurological. It is the ability of the brain/central nervous system to control and co-ordinate the muscles, creating the spring. There is something called the stretch-shortening cycle, where energy that is stored on landing is harnessed during the push-off phase, so that the muscle-tendon unit acts like a spring. It’s possible to measure this stretch-shortening cycle activity, but not during sprinting like this. I believe (and this is a bald assertion, admittedly) that what sets Bolt apart is his muscle tendon unit, and the ability of the brain to co-ordinate the timing and sequence of muscle activation. Science can’t measure this, but the next time you see a repeat of this race, watch Bolt compared to the men either side of him, and you can see it. And so just watching Bolt allows us to appreciate what it takes to be the world’s fastest man. In all of 9.69 seconds.